TOPEKA, Kan. — Entering the Class 4A state championship game, Goddard didn’t allow more than 27 points in any game this season. Bishop Miege coach Jon Holmes challenged his players to find a way to put pressure on the Lions’ defensive unit. Boy, did the Stags respond, needing less than 6 minutes of game time to score four touchdowns on picturesque sun-splashed Saturday afternoon at Weaver-Erwin Stadium. Special teams, offense and defense combined for Bishop Miege to create a nightmare start for the underdogs. The Stags rolled early, scored four unanswered touchdowns late and took home a fifth straight state tile in an eventful 69-31 victory over Goddard. The final score didn’t even underscore the dominance of Bishop Miege (11-2), which rolled up 575 yards of offense and forced six turnovers. Sam Pedrotti, the one-year senior starter at quarterback, completed a dynamically efficient 20-of-27 passes for 358 yards and five touchdowns, adding another score on the ground that capped the Stags’ first quick scoring drive. He threw touchdowns to senior wide receivers Jaylen Scruggs (two) and Hudson Bentley (two) along with a late strike to junior tight end Connor Doble. Bishop Miege junior Brison Cobbins — the shifty versatile lead running back — ran for 132 yards on 22 carries and added three more touchdowns on the ground. For Pedrotti, the outcome meant a lot for a senior tasked with following up three-time state champion starter Carter Putz. He led Bishop Miege to five dominant victories in the 4A bracket with none closer than 29 points. Goddard’s three games preceding the championship were all decided by two touchdowns or less, including a 15-14 upset of previously unbeaten McPherson in the semifinals. Taking the opening kickoff, Goddard immediately gave the ball away when Bishop Miege sophomore linebacker Jack Kincaid forced a quick fumble. The Stags recovered, and two plays later, Pedrotti waltzed in to the end zone from 18 yards out on a scramble to make it 7-0 after just 31 seconds. On the second offensive snap for Goddard, Bishop Miege junior safety Grant Fussell dove to intercept a deflected pass. Cobbins scored two plays later, breaking a tackle in the backfield and going 38 yards for the first of his three touchdowns. The Stags ended up scoring its first four touchdowns on just seven plays. Following Goddard’s first punt, Pedrotti hit Bentley along Bishop Miege’s sideline, and he broke a tackle and went 42 yards for a touchdown to make it 21-0. “We could just tell we were going to have a big day — big numbers all around,” said Bentley, who led all receivers with six catches for 176 yards. Bishop Miege forced its third turnover in four possessions when junior Rishi Rattan nabbed the first of his two picks. The Stags faced a third-and-15 play on that drive, but after a personal foul penalty, Pedrotti found sophomore wide receiver Phillippe Wesley (four catches, 118 yards) down to the Lions’ 1, and Cobbins scored on the next play to make it 28-0 with 6:14 left in the first quarter. From there, Bishop Miege simply had to maintain to keep Goddard (10-3) from entertaining upset hopes. However, Goddard drove the length of the field to score on a deflected pass late in the first quarter and then turned three giveaways from the Stages in the second quarter into 17 points. The Lions were within 14 once and 17 twice but could never come up with the stop needed to close the deficit to one possession. Instead, Bishop Miege responded to each of the scores off turnovers. Pedrotti hit a wide-open Scruggs (three catches, 57 yards) for a 50-yard touchdown to make it 35-14. Following a Goddard 41-yard field goal, Bentley turned a first down pass into a one-play, 80-yard touchdown drive, and Cobbins finished up his trio of end zone trips with a 22-yarder to make it 49-24 at halftime. Bishop Miege took the ball after halftime and converted two fourth downs on an 80-yard drive. The second came on fourth-and-goal from the 3 after a timeout with Pedrotti hitting Scruggs in coverage for their second touchdown score. Bishop Miege scored three unanswered touchdowns in the third quarter, adding a 24-yard TD connection between Pedrotti and Doble on his only catch and then a 3-yard touchdown plunge for senior linebacker Dylan Downing on one of his four carries to make it 69-24 with more than 13 minutes play. Downing led the defense with 10½ tackles (2½ for loss), while junior linebacker Mikey Welsh added 7½ tackles, one sack and an interception as Bishop Miege continued to pressure Goddard for four full quarters. With the result not in doubt, Holmes used the team’s final drive to give curtain calls to seniors who were a part of an undefeated state run for Bishop Miege in 2017. This version of the Stags endured key injuries to Daniel Jackson and TyQuez Agnew Whitten and a pair of difficult losses in the middle of the season — a one-point defeat to Rockhurst (Class 6 finalist in Missouri) and a 41-21 defeat at St. Thomas Aquinas (Class 5A state champions) two weeks later. 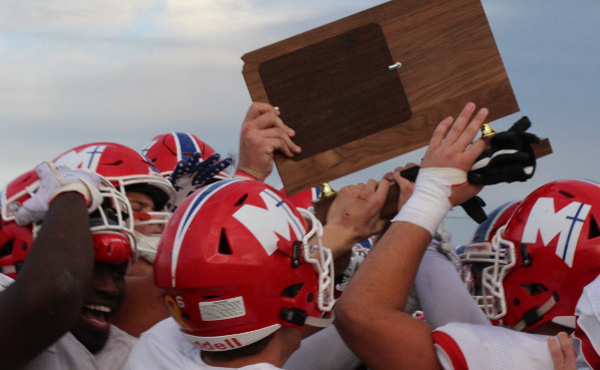 Bishop Miege then closed with six straight blowout wins, continuing a legacy of Class 4A dominance that relies on past experiences driving the current confidence. “It started our freshman year. We lost to Blue Valley back then,” Bentley said. “Those seniors showed us how to bounce back from losses and really helped us to carry on from them to where we are now.